You can also listen to an Unwinesed Narration of The Twenty throod of Novemby as MP3. Hanging in the sky is a blue-green planet known as Earth. It is a very nice planet. On the surface of the planet, vast portions of the population are in mourning. The famed writer CS Lewis passed away on the 22nd, and it will take the humans a little while to get over the event. Some Americans are also sad over a shooting in Dallas, TX that eliminated a President. Humans and their parochial interests. Now, you will note that the edges of the screen look like we are watching through a telescope. That is because we are. It is a very powerful telescope. We are watching Earth from half-way across the universe. We are standing on a planet that is in much poorer shape. 1000 years of constant war without a break can do that to a place. The solar body for the system also died of exhaustion 2 years ago, so this planet's goose is almost certainly cooked. Pity, this planet has a lot of technology. And we're standing on it, so we better make sure we get back on the ship to head home before it blows, or this is the last story you'll ever read. A woman is looking through the telescope now. Her name is Klavella Ek. Her blue skin glows in what is left of the light. She tries to position the telescope so her little baby can look through it. "Now now, Dal. Take a look at that world. It will be yours one day." The sound of a door to this mountaintop observatory closing grabs Klavella's attention. She turns around. Her husband Yarvelling has come home. We'll skip ahead four minutes to the end of the kiss, as their kisses involve a rather large number of body parts and ... well, just best to move on. Yarvelling: "I didn't know if I would get home. There was so much strife at the council. Sorry you've been without me for the last 4 days." Klavella: "Dal said his first words. 'Kill. Maim. Destroy. Cookie.' It was very sweet. Dal also fired his first gun." Yarvelling: "His first gun? How did it go?" Klavella: "We used the transporter yesterday to visit the blue-green planet you've been studying. Took us to a grassy knoll in a place called Dallas. I let Dal take a few shots. The first two went wild and flew into space. But his third shot went rather well. I think he got a human in a car downtown. The humans seemed most stirred up and alarmed." Yarvelling: "So Dal does indeed have a warrior's instinct. Very good." Klavella: "If only Dal had a world to fight for. How bad is the current situation?" Yarvelling: "Well, looking at all the factors, our world is likely to break apart and lose oxygen in the next 2 hours. That answer is why the council finally let everyone go home to their families. They decided nothing mattered anymore." Klavella: "But some things do matter. We have a transporter." At this point the part of the observatory holding the transporter collapses, and the machine falls into a ravine. Klavella: "Fortunately I have a plan D. We have a space pod big enough to carry Dal." Yarvelling: "You would launch our baby off into space all on his own?" Klavella: "We have the coordinates for Earth locked in. Dal would get there in just a few years. I have designed a bodysuit that Dal could survive in for the journey and in their opressively clean atmosphere. The minds of certain writers and others have been altered so that Dal will be welcomed and mistaken for something they thought of. Dal can live disguised as a toy until his mind is ready to download the cultural history of our planet. Besides, we've talked for years about conquering Earth. Dal will be our legacy, taking down that smug world." Yarvelling: "So many variables. We will be sending Dal into a life that is probably worse than the death we face tonight. How can you do that?" Klavella: "Have you listened to yourself, Yarvelling? You're sounding like a member of the Pacifist Alliance. BTW, the Pacifist Alliance are trying to breach the observatory downstairs right now, and will most likely slit the throats of us in a few minutes, so we're not even going to see our world die. All we can do now is save our baby, and doom Earth in the process." Klavella: "My poor, dear husband. As far as the universe is concerned, you will be remembered as the warrior, physicist, and blood lusting fiend that you lived your life as. No one will thing of you as a vile pacifist. My final gift. Dal, we must get you ready for your trip through space?" Dal (very high pitched voice): "Cookies? Slaughter?" Dave Ross: "It is the end for you and Yarvelling. Peace will win! Prepare to die!" Klavella: "Yarvelling is dead. But his legacy is assured. While you were breaking in I launched the pod. Dal is away." Dave Ross: "How can you subject another planet to the misery Ska-Ro has gone through? Are you completely insane?" Klavella: "Would an insane woman think to booby trap the door so that if it is broken down and a certain general walks through, the whole mountain nukes itself a few minutes later? Because I think that requires a great deal of thinking." Oh dear indeed, readers. We're still on the mountain. Quick, into our spaceship! Takeoff procedures! Get into the atmosphere. As we can see, the mountain exploded, and the forced ripped through Ska-Ro. The planet was already at the point of collapse, and everything has disintegrated. Empty blackness where Ska-Ro existed. Flying through space, a pod carrying the evil that is Dal Ek is rapidly approaching Earth. 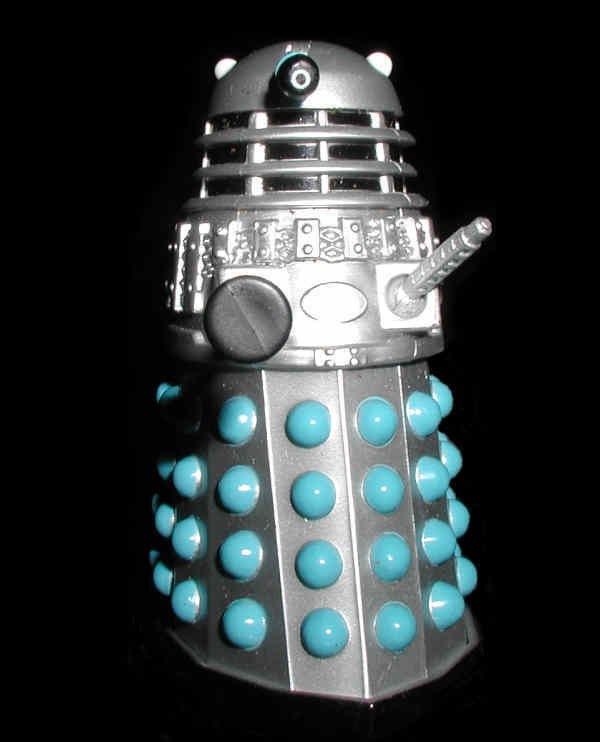 On that planet, everyone will believe he is a toy, and Mr Dalek will slowly grow his power and influence. One day, when he leasts expect it, Mr Dalek will learn his origins. And that will be an interesting day.